Quaker Oat So Simple porridge sachets with natural Golden Syrup flavour. Oats are a natural powerhouse of goodness, the positive nutrition kick starts your morning. Delicious 100% wholegrain oats bursting with goodness. Containing beta glucan to help lower cholesterol. 18x porridge sachets ready to eat in 2 mins. 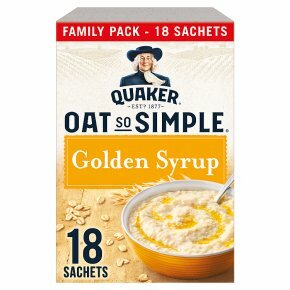 Quaker Oat So Simple Golden Syrup family pack porridge sachets For over 140 years, the Quaker Oats family has been inspired to produce delicious, nourishing breakfasts. Quaker Rolled Oats are our oats in their purest form. Cut, kilned and rolled to the same thickness, and with no artificial colours, flavours or preservatives; our wholegrain oats maintain the delicious taste you would only expect from Quaker. Our porridge sachets come in a variety of natural flavours and are ready to eat in 2 minutes. Cooking Instructions1 Simply boil 180 ml (one sachet) of milk in a saucepan.2 Stir in contents of one sachet of oats.3 Simmer for 2 mins, or until milk is absorbed, stirring occasionally.